Go to original pattern for design DROPS 178-28. Knitted jacket with seam-less sleeves and rib, worked bottom up in DROPS Alpaca Bouclé. Sizes S - XXXL. 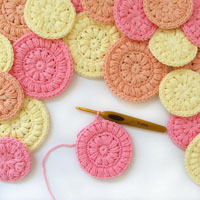 DROPS CIRCULAR NEEDLE (80 cm / 32'') SIZE 5 mm/US 8 – or the size needed to get 17 stitches and 22 rows stockinette stitch on 10 cm / 4'' in width and 10 cm / 4'' in height. All increases are from the right side! 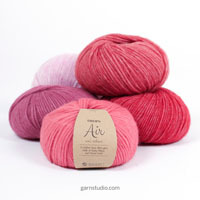 Increase 1 stitch by making a yarn over. On the next row knit the yarn overs twisted to prevent holes. See diagrams A.1 and A.2. The diagrams show all the rows in the pattern from the right side. The piece is worked back and forth with circular needle in sections which are sewn together at the end. Cast on a little loosely 74-83-92-101-110-119 stitches with circular needle size 5 mm / US 8 and Alpaca Bouclé. Work 3 RIDGES – see description above. The next row is worked as follows from the right side: Work 1 edge stitch in garter stitch, work A.1 (= 9 stitches), repeat A.1 until there is 1 stitch left, 1 edge stitch in garter stitch. Continue in this way, back and forth until the piece measures 50-51-52-53-54-55 cm / 19¾''-20''-20½''-21''-21¼''-21 5/8''. REMEMBER THE GAUGE! Work 6 stitches garter stitch, start on the 7th-1st-4th-7th-1st-4th stitch in diagram A.1 and work the rest of the diagram. Repeat A.1 until there are 6 stitches left on the needle and work 6 stitches garter stitch. When the piece measures 72-74-76-78-80-82 cm / 28 3/8''-29 1/8''-30''-30 3/4''-31½''-32¼'' bind off the middle 16-17-18-19-20-21 stitches for the neck and each shoulder/sleeve is finished separately = 64-65-66-67-68-69 stitches. On the next row from the neck, bind off 1 stitch = 63-64-65-66-67-68 stitches. When the piece measures 74-76-78-80-82-84 cm /29 1/8''-30''-30¾''-31½''-32¼''-33'' bind off loosely – make sure the bind-off edge is not tight! Work the other shoulder/sleeve reversed in the same way. 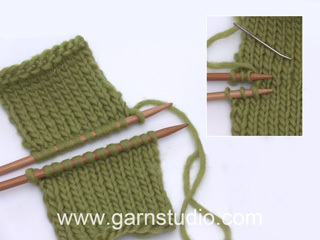 Work 4 stitches in garter stitch for the band. 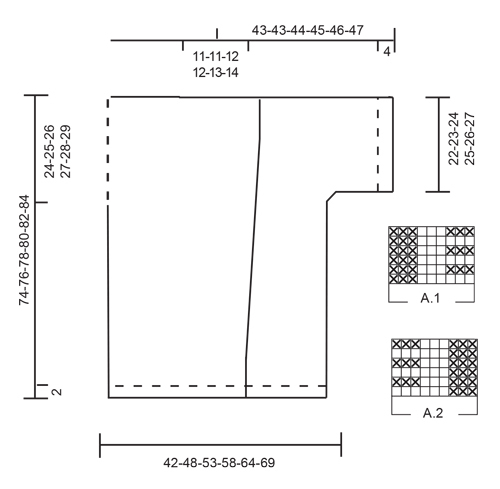 Start on the 1st-1st-7th-7th-4th-4th stitch in diagram A.2 (= 9 stitches) and work the rest of the diagram. 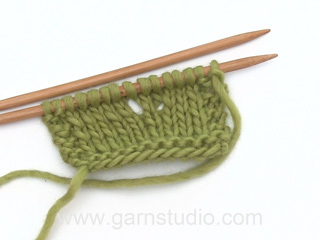 Repeat A.2 until there is 1 stitch left on the needle and work 1 edge stitch in garter stitch. 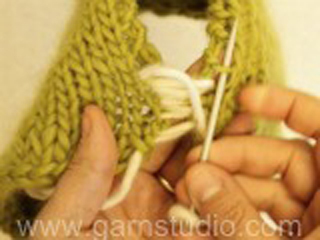 When the piece measures 8 cm / 3 1/8'' in all sizes increase 1 stitch inside the 4 band stitches in garter stitch towards mid front – READ INCREASE TIP! Increase in this way every 8th-6th-6th-6th-6th-6th row in total 11-11-17-15-13-7 times and every 10th-8th-8th-4th-4th-4th row 4-8-4-12-17-28 times = in total 15-19-21-27-30-35 stitches increased towards mid front. The new stitches are worked into the pattern as you go. AT THE SAME TIME when the piece measures 50-51-52-53-54-55 cm / 19¾''-20''-20½''-21''-21¼''-21 5/8'' cast on new stitches at the end of each row from the right side as follows: Cast on 2 stitches 2 times and 31-28-25-22-19-16 stitches 1 time (= a total of 35-32-29-26-23-20 new stitches for the sleeve in the side). The new stitches are worked into the pattern as you go and the outermost 6 stitches are worked in garter stitch for the sleeve edge as for the back piece. When all the increases for the sleeve and the wrap- around are finished, there are 109-110-112-115-118-120 stitches on the needle. When the piece measures 74-76-78-80-82-84 cm / 29 1/8''-30''-30¾''-31½''-32¼''-33'' work as follows on the next row from the right side: Work the first 46-46-47-49-51-52 stitches before placing them on a thread, bind off loosely the remaining 63-64-65-66-67-68 stitches on the needle for the neck. Make sure the bind-off edge is not tight! Cast on a little loosely 59-59-62-62-65-65 stitches with circular needle size 5 mm / US 8 and Alpaca Bouclé. Work 3 ridges. The next row is worked from the right side as follows: Work 1 edge stitch in garter stitch, work A.2 until there are 4-4-7-7-10-10 stitches left on the needle, work 0-0-3-3-6-6 stitches in A.2 (in sizes S and M no stitches are worked), work 4 edge stitches in garter stitch. When the piece measures 8 cm / 3 1/8'' in all sizes increase 1 stitch inside the 4 band stitches in garter stitch as for the right front piece. And when the piece measures 50-51-52-53-54-55 cm / 19¾''-20''-20½''-21''-21¼''-21 5/8'' cast on new stitches for the sleeve at the end of the row from the wrong side in the same way as for the right front piece. The new stitches are worked into the pattern as you go and the outermost 6 stitches are worked in garter stitch for the sleeve edge as for the right front piece and the back piece. When all the increases for the sleeve and the wrap-around are finished, there are 109-110-112-115-118-120 stitches on the needle. When the piece measures 74-76-78-80-82-84 cm / 29 1/8''-30''-30¾''-31½''-32¼''-33'' work as follows on the next row from the right side: bind off loosely the first 63-64-65-66-67-68 stitches on the needle, then work the remaining 46-46-47-49-51-52 stitches before they are placed on a thread. Sew the shoulder/sleeve seam. Sew together under the sleeve and side seam in one go inside the 1 edge stitch. Place the 46-46-47-49-51-52 stitches from the right front piece back on the needle, knit up 18-19-20-21-22-23 stitches back of the neck and place the 46-46-47-49-51-52 stitches from the left front piece back on the needle = 110-111-114-119-124-127 stitches. 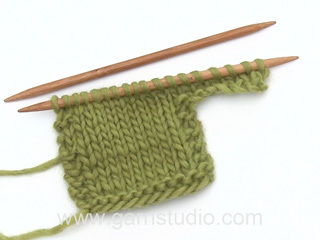 Work 5 cm / 2'' in garter stitch, bind off with double strand and make sure the bind-off edge is not tight! Cut and fasten the strands. En la parte que indican los aumentos para las mangas no es claro, es en cada vez que se hace un diagrama? Ich hatte keine Probleme mit der Anleitung. Meiner Meinung nach, ist es jedoch vorteilhaft die Strickgrundlagen zu beherrschen und sich genau durchzulesen, was in der Anleitung steht. Dieser Schnitt ist gerade für Damen geeignet, die größere Kleidergrößen tragen. Ich habe das Revers übrigens komplett im Krausrippen-Muster gestrickt. Das sieht sehr edel aus. Liebes Drops-Team, Dankeschön! Diese Anleitung gehört ab jetzt zu meinen Favoriten! Eine ausgesprochen schwer zu verstehende Anleitung, gilt auch für das Diagramm. Bis zur Maschenaufnahme für die Ärmel ist alles ok, doch mit dem Rest quäle ich mich seit Tagen - schade um das schöne Bouclégarn.